Hive matched to the crop area and type of crop. Used to improve pollination on a range of crops including tomato, pepper, aubergine, strawberry, raspberry, berried ornamentals, seed production. Introduce when pollination is required. Freeze dried pollen may be used if there should be insufficient flowers or pollen for the bees. A door lock system may be closed at night when the bees have returned to the hive to keep them in - this may allow for some crop protection measures to take place with the bees out of the crop. The rate of introduction is matched to flower numbers. The type of hive is matched to the type of flower - availability of nectar etc. 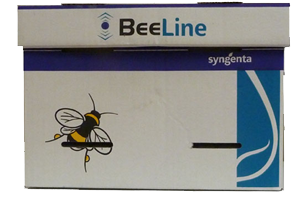 The pollination service and or hives are subject to licence conditions and are for use only in commercial glasshouses or polytunnels.